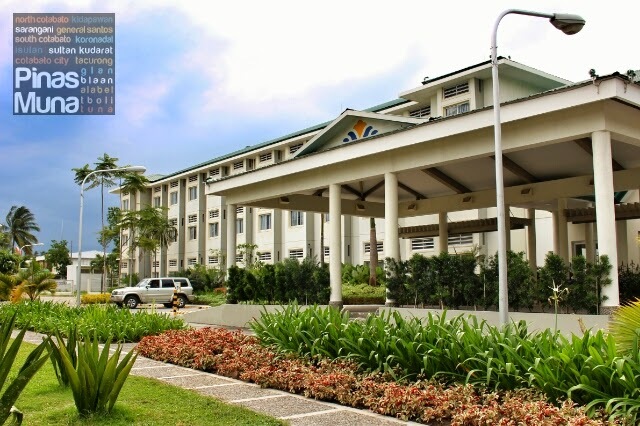 Microtel by Wyndham - General Santos is a 66-room hotel located at the Valley High Complex, along the National Highway in General Santos City, Philippines. It's the 10th branch of the international hotel group in the Philippines which opened in early 2013 making it one of the newest hotels in General Santos City. 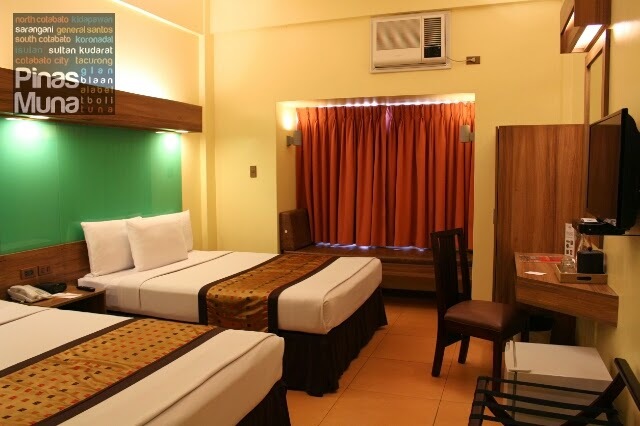 Microtel Gensan is strategically located near the city's commercial area, but in a good distance away from the busy daily grind of the city, ensuring both convenience and tranquility. The Valley High Complex houses the hotel as well as some of the high-end restaurants in the city, adding even more convenience to the hotel's guests through the wide range of dining options that suite every taste. 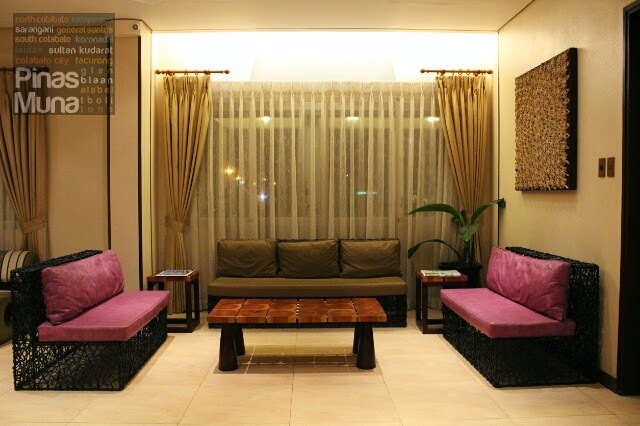 The hotel lobby's interior showcases the high quality and classy design of local handicrafts of the Philippines. World-class hospitality and customer service also welcomed us at the hotel's front desk. Checking-in was very efficient. After filling out the registration form, two key cards were handed to us by the receptionist and our room was ready in no time. Our Queen Double Room was located on the second floor of the three-floor building. There's an elevator so getting up and down the building is very convenient. When we entered our room, the air-conditioning was already on, what a great way of welcoming guests! Staying at Microtel is not new to us. 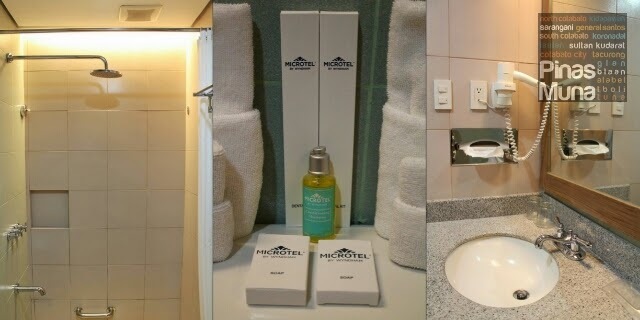 We have stayed at Microtel Cabanatuan, Microtel Baguio, Microtel Davao, and it felt like we were at home when we stayed at Microtel Gensan. 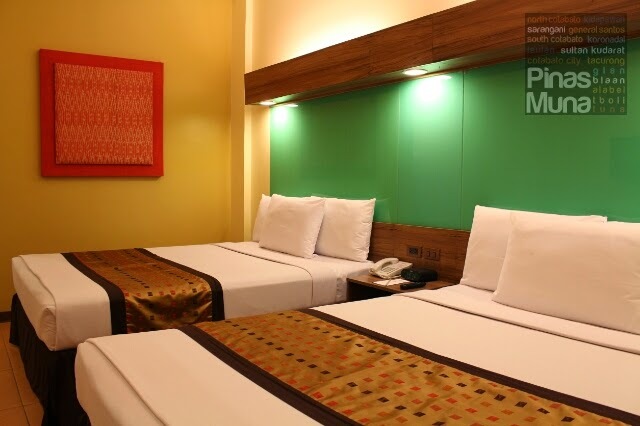 The room layout in all Microtel properties is almost the same, only the color theme is different. 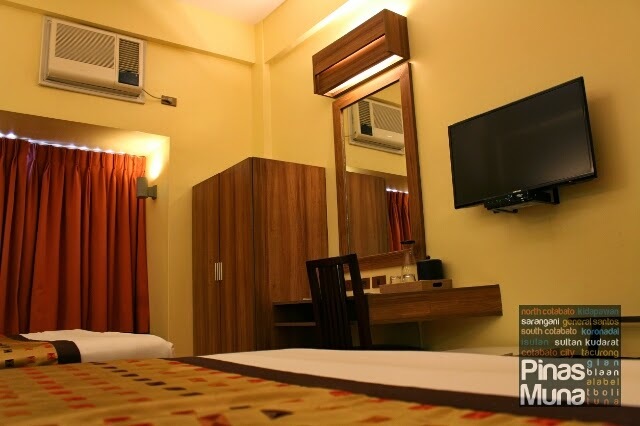 Here at Microtel Gensan, the dominant colors are brown, copper and sienna, warm earth colors that match the warm climate of General Santos City. Just like at the lobby, our room also showcases local handicrafts of the region. 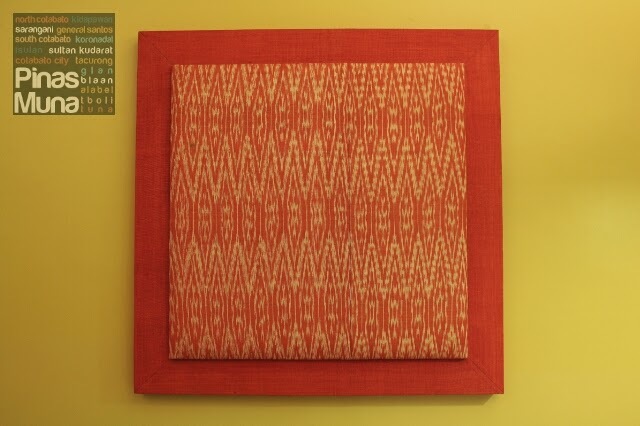 Hanging on the wall is a t'nalak weaving created by the T'boli tribe of South Cotabato. Microtel also takes pride in their chiropractic-approved mattresses that guarantees a relaxing and rejuvenating sleep. The fluffy pillows had the right firmness. The pillow covers and the bedsheets smelled clean and fresh. 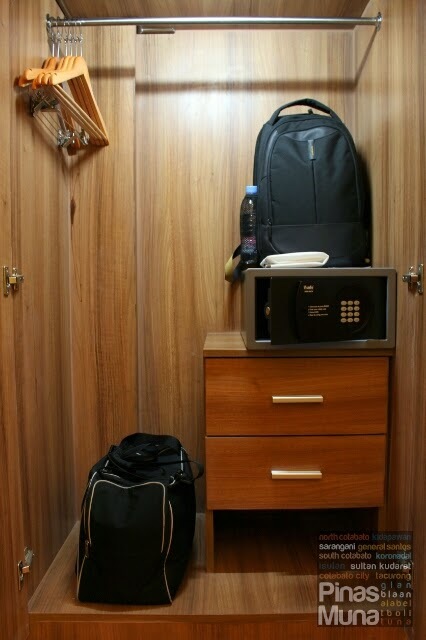 The room measures 25 sqm that comfortably fit two queen-size beds, a study table, a mini refrigerator and a wardrobe with safety deposit box. There's really a lot of space to move around. Other en suite amenities include an individually controlled air-conditioning unit with remote control, an LCD TV with cable channels, and a telephone. The en suite bathroom was equally clean. The tiles looked new and well maintained. It smelled fresh and well sanitized. 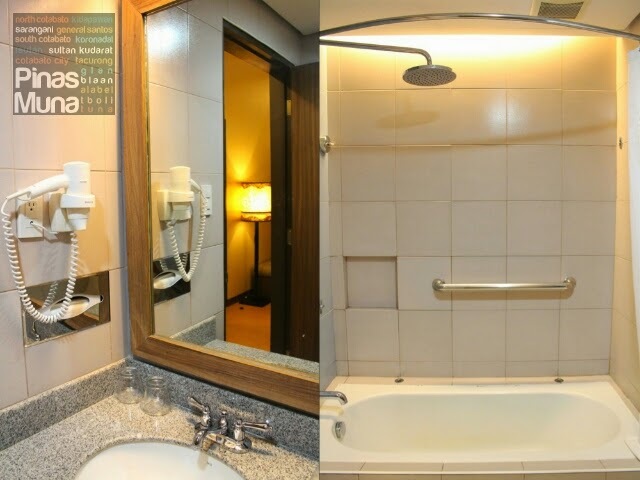 Consistent with other Microtel properties, Microtel Gensan also installed bidets in all of its rooms, a hygiene feature that many Filipino and foreign guests are very particular with. The walk-in shower has hot and cold water. Rain shower heads are also installed. Water pressure was excellent! Complete toiletries were provides as well. There's soap, shampoo and dental kits. Hair dryer is also available inside the bathroom. Most importantly, the towels smelled clean and fresh. We also got the chance to view their Suite Room. It has a bigger floor area of 30 sqm that can fit one queen-size bed, a day bed, a study table, a wardrobe, a coffee table, and a mini kitchen. 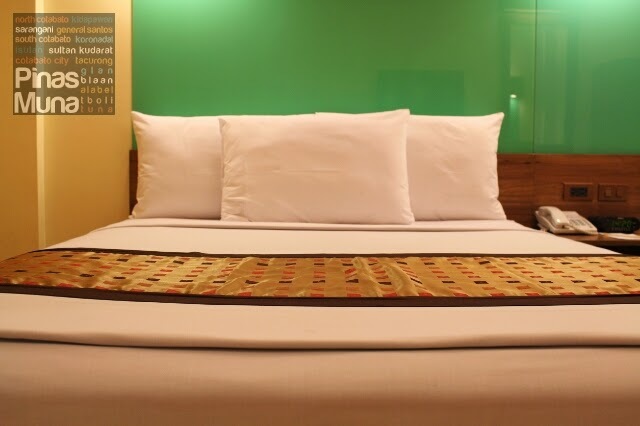 The Suite Room is also appointed with a chiropractor-approved mattress, an individually controlled air-conditioning unit with remote control, an LCD TV with cable channels, and a telephone. Separating the bed from the mini kitchen is a divider. This is quite a different layout compared with Microtel properties where the mini kitchen serves as a divider between the bed and the dining area. The mini kitchen also features classy furniture and fixture that are proudly Philippine made. The coffee table can comfortably seat two guests who prefer en suite dining. The great thing about Microtel Gensan is that guests can order food from restaurants within the Valley High Complex and have them delivered inside their room. 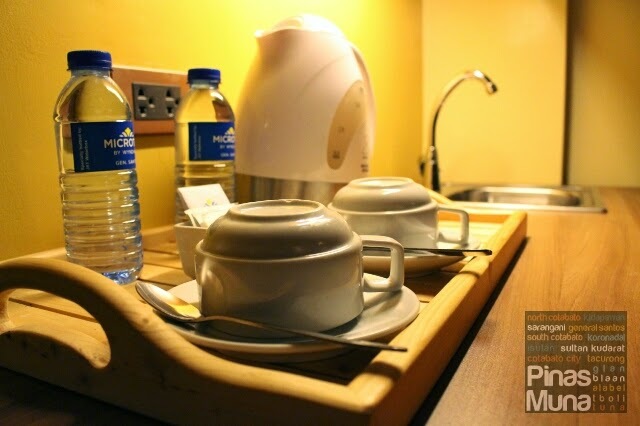 Truly, guest comfort and convenience are given top priority by Microtel Gensan. Tip: Front Desk has a copy of the menu of every Valley High restaurant. The mini kitchen is equipped a mini refrigerator, a microwave oven, a sink, and a water heater. 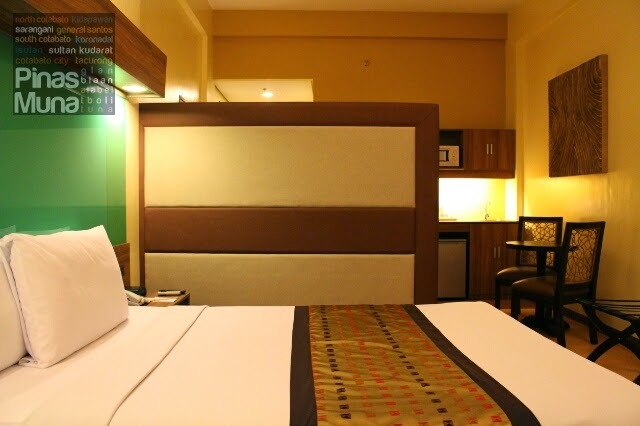 Microtel Gensan's Suite Room is so far the most elegant Microtel Suite Room we've seen. 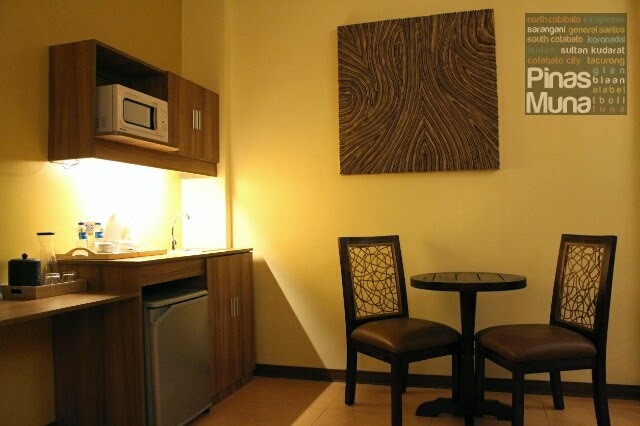 We hope that other properties in the Philippines would follow the same layout of Microtel Gensan. The en suite bathroom also features a walk in shower with hot and cold water. Complete toiletries set is also provided. The toilet is also equipped with a bidet. Further adding to the luxurious experience of the Suite Room is the en suite bathroom's tub. 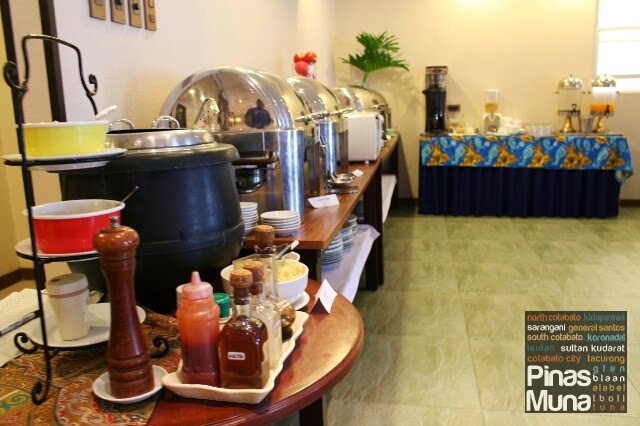 The room rate includes buffet breakfast for two which is available at the hotel's lobby between 6:30am and 10:00am. 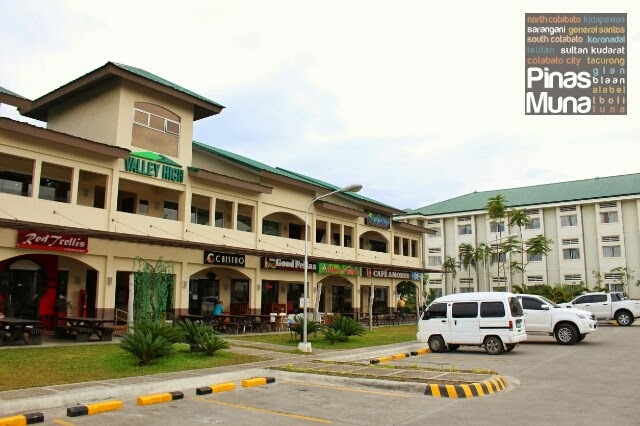 The restaurants at Valley High Complex serve as concessionair for Microtel Gensan's breakfast. To keep variation to their breakfast offerings, restaurants were given a rotationg schedule. During our visit, it was BIGBEN Steaks & Grills serving breakfast. 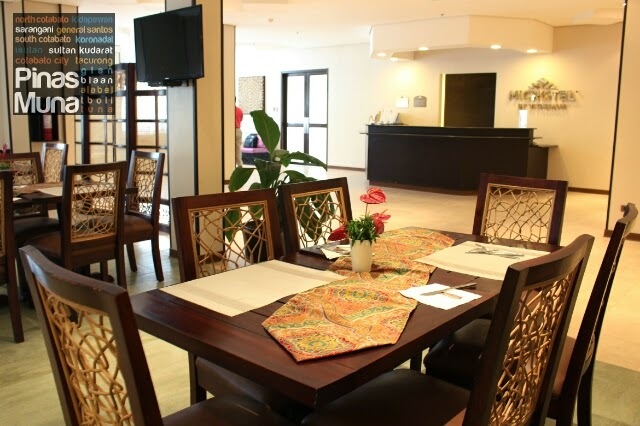 Consistent with the overall interior desing of the hotel, the dining area also features locally made furniture. The are is spacious and well airconditioned. Food servers are very well trained to handle guests. 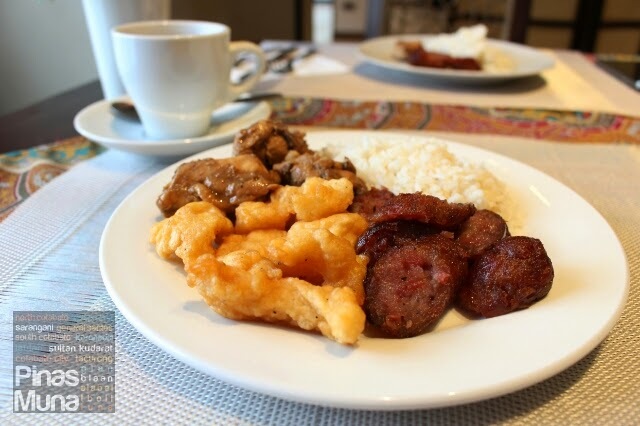 For breakfast, I had the longganisa, the fish fillet and chicken adobo, and paired them with garlic fried rice. They served a sweet-variant of longganisa which I enjoyed with vinegar. The fish fillet was moist and tasted fresh. The chicken adobo was tender and wasn't oily or salty. 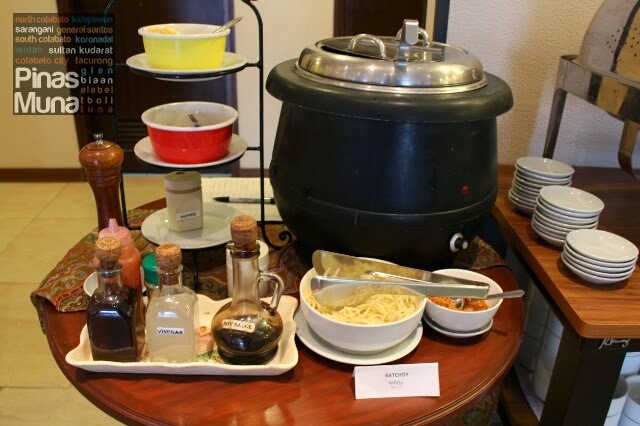 There's also a section for Batchoy or a chicken based noodle soup that is enjoyed by many in Gensan as breakfast or meryenda (snack). Batchoy is such a hit in Gensan because there are a lot of migrants here from Iloilo where the Batchoy originated. For a ligher breakfast, you can opt for cereals or fruits. 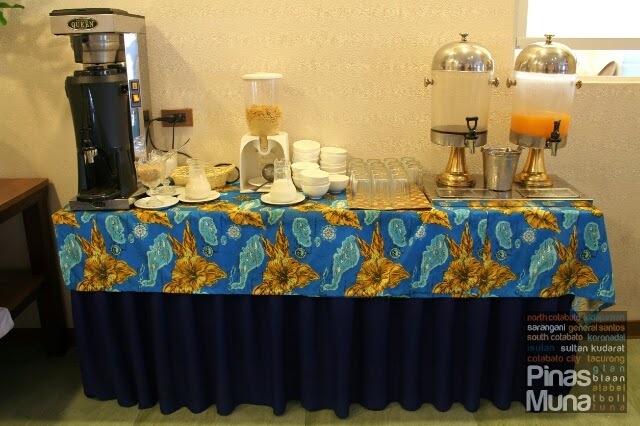 There's flowing coffee as well so coffee-lovers will surely enjoy their breakfast at the lobby while reading the newspaper or browising through their tablets. Overall, we enjoyed our stay in Microtel General Santos. 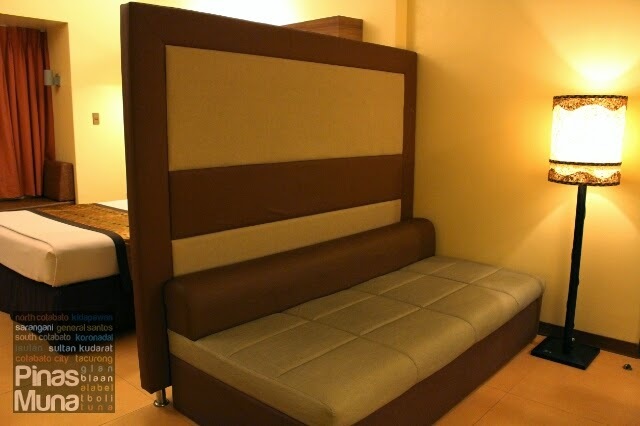 Their ultra comfortable beds will keep us coming back to this hotel whenever we visit Gensan. 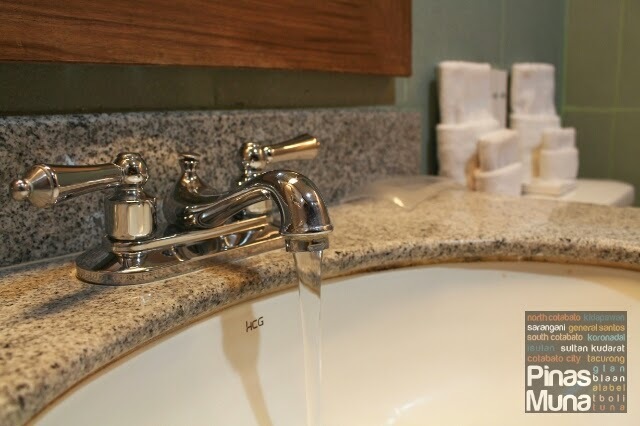 Their well maintained facilities and amenities as well as their outstanding customer service also add to the experience.